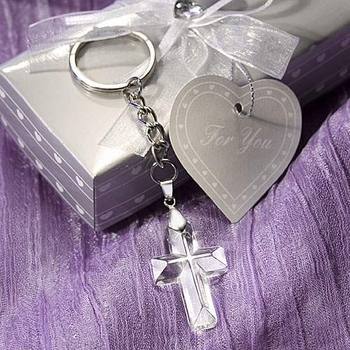 Reaffirm your faith with these classically designed cross key chain favors made of radiant crystal. Perfect for Christenings, First Communions, Baptisms or any other religious occasion, these beautiful favors will help to commemorate the blessed occasion! This visually stunning favor features a multifaceted cross charm with a durable silver metal chain and ring attached to the top of the cross. The dimensions of the key chain cross measures 1 inch by 1/2 inch with a total of 4 1/4 inches including the chain.